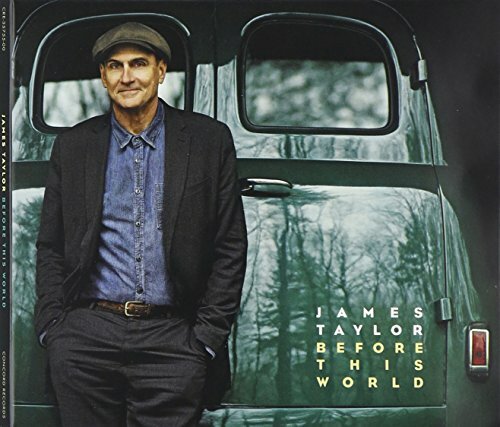 I have now had the chance to listen to the Limited Edition Deluxe Book version of James Taylor’s 2015 released, Before This World. Here are my thoughts. I love James Taylor’s music. I have been a fan for a very long time. I might even say his music has been sort of a soundtrack of my adult life, for I was an adult when I really started getting into his music. Over the years, I have collected almost all of his albums, minus a couple of compilations that didn’t offer something I already had in my collection. So when I heard Mr. Taylor was going to be releasing a new album in June 2015, I knew I had to have it. I pre-ordered the digital version from iTunes because some tracks were released ahead of the official release date of June 16, 2015. Then I went to JamesTaylor.com and ordered a copy of the Limited Edition Deluxe Book version of the album. It was a rather pricey endeavor and not something I would have bought from just any artist. Shipping alone on it was $27, whether I had it sent to my APO box or to my physical address in Germany. Since APO has been rather unreliable lately, I had it shipped to Germany. For the deluxe set, I paid $79.99, so for the whole thing, I spent over $100. Whether or not it’s worth that much to everyone is a matter of opinion. For me, it was worth the expense because the deluxe version includes a bonus disc and DVD. It’s the bonus disc that I really love. Why? Because of one special track entitled “SnowTimeLine” (Evolution of the song “Snow Time”). This nine-and-a-half minute track offers listeners a rare chance to hear James Taylor’s creative genius at work. It begins with a metronome and fuzzy sounding guitar and James singing along, figuring out the lyrics. The song continues, becoming more and more fleshed out. You hear Taylor speak, whistle, come up with the story as the guitar and metronome continues. I found this track absolutely fascinating. I don’t write songs, but I do write every day and I recognize that creative process. To hear it from someone like James Taylor, especially when he gets a little silly, is kind of a thrill. But I also understand that not everyone will appreciate it. I think it’s a feature strictly for music nerds. Add in the fact that Taylor includes an envelope filled with copies of the notes he used to write his lyrics and you have a music nerd’s paradise. A video about the song “Snowtime” and how it evolved. The bonus disc also includes a demo version of the song “9lb Hammer”, which begins with a drum beat and Taylor rapping along to it. It’s another glimpse of his genius when it comes to songsmithing, though some might miss hearing his glorious singing voice. “6/4 Shuffle” is a bluesy instrumental that is fun to listen to, though again, I miss Taylor’s vocals. On the other hand, I am also reminded of how much his music has changed since the early 1970s. If you need a reminder, a previously unreleased version of “Joshua Gone Barbados” from 1983 will take you back a bit. Actually, it reminds me a bit of something I might hear from Jimmy Buffet, with an injection of country. You also get a nice 2003 live version of “Whenever You’re Ready”, a song that was featured on Taylor’s 2002 album, October Road, which was his last album of original music. The rest of the album includes beautifully crafted songs with very personal lyrics. Taylor is now 67 years old, on his third marriage, and raising twin sons Henry and Rufus with his wife, Kim, who joins him on a couple of songs. Henry Taylor also contributes vocals and I can hear that at least one of the twins inherited that distinctive Taylor sound I can also hear in brother, Livingston Taylor, daughter Sally Taylor, and older son Ben Taylor. It’s fascinating to hear James Taylor’s blood family members sing. Hearing them is a reminder to me that the ability to sing is definitely genetic. Every song on this album is strong, but I think my favorites include “Snowtime”, the beautiful love song “You and I Again”, and even “Far Afghanistan”, a song about war. I don’t usually like songs about the military, especially from people who have no actual military experience. I just think James Taylor did a great job with the lyrics, which offer a gritty look at being a soldier. The arrangement includes a shehnai solo by Rajendra Prasanna, giving the song a Afghan flavor. Sting and Yo Yo Ma also put in appearances on “Before This World”. Yo Yo Ma also plays cello on “You and I Again”. The rest of Taylor’s long time band are in attendance, as well. Arnold McCuller, David Lasley, Andrea Zonn, Michael Landau, Larry Goldings, Luis Conte, and Kate Markowitz have all been with Taylor for ages. He must be a great boss. What can I say? I really like Before This World and I’m glad I bought it twice. For those who don’t want to spring for the Deluxe edition like I did, keep in mind that Target is also offering a limited edition of this album that include tracks that aren’t on the Deluxe edition. If I were in the States and could easily get to a Target, I’d probably be buying that one, too. You can also pick up the “Target” version on Amazon.com. I will link to it below. That version has the extra songs “I Can’t Help It If I’m Still In Love With You”, “Diamond Joe”, and “Pretty Boy Floyd”… ah, what the hell. I guess I’ll order that one, too.